It's that time again! For those not in the know, Sabbat Box is like Loot Crate for pagans, offering sabbat-related goodies from pagan-owned small businesses two weeks before each holiday. This subscription box service would be perfect for the beginner and advanced pagan alike. Sabbat Box has released yet another amazing compilation of sabbat-related items for Lammas / Lughnasadh and I'm here to let you know what's inside! 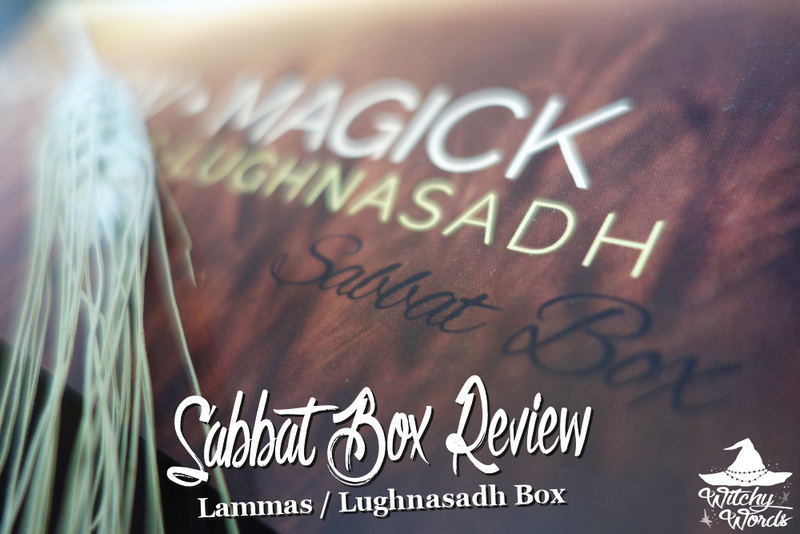 As always, Sabbat Box comes in a manageable size and sits just outside your door waiting for you upon arrival. Sabbat Box actually came at the same time as our roommate's Loot Crate subscription and I can confirm for a fact that Sabbat Box is larger and has more items than its famously geeky counterpart. And here it is opened and ready for the harvest! Upon first glance, you can't mistake this box being for any other holiday. The wheat stalks give it away just as much as the pamphlet. The pamphlet is of course a three-panel sheet describing both the contents of the box and the holiday's lore and correspondences. Not only will it help you use what they've sent you but it'll help you celebrate as well! I'm actually pretty terrible at being able to follow along with instructions, so if I say these are easy to follow, I promise you that they actually really are. Want your own kit? Sabbat Box is selling them in their store! Click here. The next item I quickly found was the hand painted beeswax tapers from Aloha Bay Candle Company. Beeswax is a great alternative to other kinds of wax your standard candles may be made out of: It's all natural, last longer and has prosperity and energy components that will empower spell work and ritual! My circle used the taper for our Lammas ritual as well. Because fellow CF member Phaedra picked up the subscription too, we've had double to offer at each event. End goal is to have at least half of the circle, if not more, have a subscription so that it can be regularly incorporated! If you're the kind of pagan or witch who likes to anoint candles to charge them, Sabbat Box has you covered with the Prosperity Candle Fixing Blend from The Vodou Store. If you've never anointed or "fixed" a candle before, there are many different ways to do it. Sabbat Box's blog suggests clockwise and upwards for invoking or manifesting while banishing is counter-clockwise and down. You could also start at the center and anoint directly outward for sending out to the universe or start at the ends work inward for nullifying. However, I'm pretty sure you're going to want to manifest prosperity. Keep that in mind as you work! When Hugh asked me bread or scones for Sabbat Box, I couldn't answer. I have Celiac Disease, so either way is a lose for me. But when I asked my roommate and fellow Circle of Fountains member Tony, it was scones all around. Turns out, that must have been the majority opinion because the box contains a cinnamon apple scone mix made especially for Sabbat Box by Rabbit Creek Gourmet. It certainly smells delicious! And the scone mix comes with the most adorable little whisk (penny for reference). Is it strange that I was really excited about this piece? The whisk went straight onto my altar, which you'll see in just a day or two! Each Sabbat Box usually comes with some sort of incense and this one is no different. This Precious Amber cone incense made by HEM is perfect for Lammas because of its prosperity and protection qualities. Plus, as I can attest from our ritual, it smelled absolutely amazing! If you've never lit cone incense before, the Sabbat Box blog offers a short tutorial (click here). This box also includes a white sage bundle from AtlantaCandlesandIncense.com. While smudging is strictly an intricate Native American tradition, smoke cleansing or saging is open for use. If you're more familiar with the term smudging, smoke cleansing is probably what you're actually doing. And what better way than to cleanse with a freshly dried sage bundle? If you're a solitary, this little guy could come in handy not just for this ritual but many to come! Last but not least, each Sabbat Box includes a copy of Llewellyn's Sabbat Essentials series for each holiday. These are definitely more beginner guides, but they're perfect if you're not sure what direction to go when celebrating. Each book contains lore, correspondences, recipes, spells and more for each sabbat. CF member and fellow Sabbat Box subscriber Phaedra said one of her kids ran off with the book and won't give it back because it's a good read. I think that speaks wonders about the usefulness of the item! Once again, Sabbat Box has provided the perfect collection for the holiday! While I'm always pleased with the quality and quantity of each box, this one felt particularly packed with Lammas-related goodies. Many of the items were interactive, some of them were meant to be used together and, overall, the items formed a cohesive ritual for any subscriber. It's frustrating that they have a waiting list now. :( I have been following them for a few months now but wanted to wait until I saw reviews before dropping 40 dollars. Seems I waited too long. :D Looks awesome though. Hopefully I can get in there for Samhain! Oh no! Really?! I have been doing the same thing! Plus I knew we were moving and didn't want to deal with the hassel of changing my address on yet another item. I was hoping to have a box for Halloween. Bah!